Think it’s difficult to get a bad credit car loan in Prince Edward Island? Think again. Our car loan service makes it easy for you to get the financing you need to buy a car. We won’t share or sell your info. Ever. Our auto loan rates in PEI are market-competitive. How do I qualify for a car loan through your site? We only have a few basic requirements for drivers in PEI (and the rest of Canada). For your car loan application to be approved, you need to be a resident of Canada, have a full license, be 18 or older, and earn $1,500 per month or more. Does LowestRates.ca only work with specific car dealers in Prince Edward Island? Yes. These dealers are part of our nationwide auto loan network, and they specialize in bad credit auto financing for Canadian drivers. So if you have bad credit or no credit, don’t sweat it: we’ll match you with one of these dealers in PEI and help you quickly get approved for a loan. How much tax do I need to pay on a car purchased in Prince Edward Island? Currently, the sales tax (HST) on vehicles in Prince Edward Island is 14%. But that’s set to change: in October 2016, the HST rate in PEI will increase to 15%. How do you set the interest rate on my car loan? Your rate is actually set by the dealer offering you the loan, and it’s based on a number of different factors, such as your credit, income level, employment history, and loan amount. Longer loan terms result in smaller monthly payments, but there’s a downside: you’ll end up paying more money toward interest, and, for a few years, you’ll probably owe more on your loan than your car is worth. Why? Because you’ll be paying off your loan balance slower than your vehicle is depreciating. 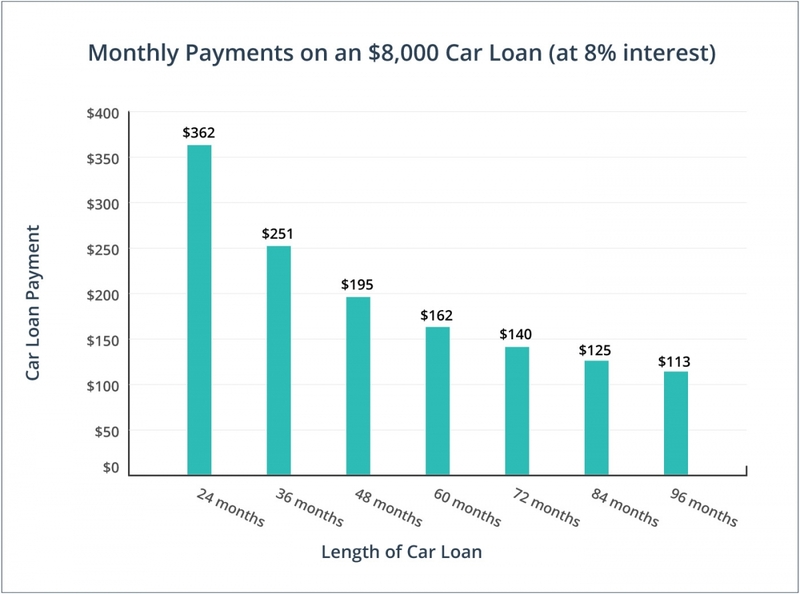 Here’s what your monthly payments would look like over different lengths of time on an $8,000 car loan at 8% interest. Get your car loan before you shop for a vehicle. You’ll be able to set a realistic budget before you get to the dealership and you’ll know which vehicles you can actually afford. Owning a car is expensive. Before you go ahead with your car loan, consider all the other costs of owning a vehicle: regular maintenance, repairs, gas bills, and, of course, car insurance. Registered dealers have to follow a set of rules and regulations aimed at protecting buyers from fraud and generally shady practices. Take your car out on the road before you purchase it. See how the vehicle performs at different speeds and on a variety of different roads. Because Prince Edward Island is a small market, borrowers pay higher car loan rates. False. Borrowing costs in PEI are very much comparable to borrowing costs in other provinces. Bad credit auto financing is only available in large provinces like Ontario and Quebec. False. Bad credit auto financing is available in smaller markets throughout Canada. Prince Edward Island is a great example — our auto loan network operates in this province everyday. You have 1 month (30 days) to return your used car and get a full refund. False. Unfortunately, there’s no return policy on used car purchases in Prince Edward Island. That’s why you need to take your prospective vehicle for a test drive before you buy. You don’t need to do a vehicle inspection if you buy a car through a dealer. False. While some PEI dealerships do conduct a vehicle inspection prior to selling, it’s always a good idea to have another, independent mechanic take a look at the car you’re interested in. Auto sales are on a roll in Prince Edward Island. New vehicle sales increased from 7,555 in 2014 to 7,976 in 2015. Prince Edward Island may be a small province, but it’s home to over 25 auto dealerships. Even better, a few of them are part of our auto loan network. Dealers in PEI need a license to buy and sell vehicles. In order to keep that license, they need to follow a variety of rules and regulations aimed at protecting consumers. It’s easy to get charged up in Prince Edward Island. PEI is one of the most EV friendly provinces in Canada, with more than a dozen electric vehicle chargers now operating across the island.